Clacton Pier stands out as a testament to how piers can evolve, yet retain their classic features, which makes Clacton Pier a popular and indeed, much loved and quite distinctive pier. 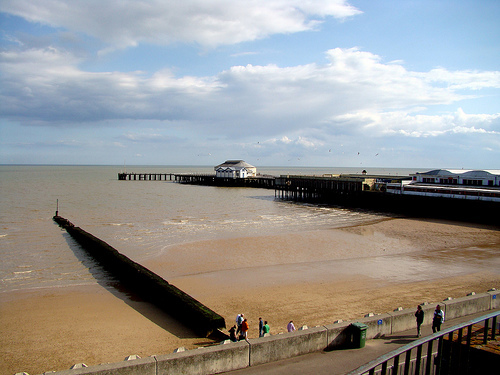 Originally, Clacton Pier was constructed as a rather modest wooden pier that first opened to the public in 1871. At this point Clacton, or to use its full and official title, Clacton-on-Sea, was a quiet and gentle little village, with few facilities. However, within easy reach of London, it soon became apparent that Clacton would be able to provide Londoners with a much-needed break from city life, due to the fact that it had excellent rail links with London. Yet when it was built, the pier was designed as a landing pier that could easily accommodate both goods and it was hoped, passengers. It was not designed to be a tourist attraction in its own right. But soon it became a popular spot for people who just wanted to stroll down the promenade and take advantage of the bracing sea air. Clacton’s popularity grew, with people arriving by both rail and sea. It was situated close enough to London that people could come just for the day, which made it a real tourist ‘hot spot’ for the Victorians, with their love of sea air and its reputedly therapeutic effects. Gradually it became apparent that the facilities the pier provided could not meet the demand from the sheer numbers of people visiting, so the pier was extended in 1893, with work having started in 1890. The new pier was to be a substantial construction, now reaching some 360 metres (1,180 feet) in length. Architecturally the facilities provided were daring and quite innovative, with a pitch pine pier head and a striking pavilion that was of a regency inspired style as well as a concert hall, a waiting room and refreshment facilities. Clacton was now ready to not just greet the public, but also to cater for them in style. Through the early part of the 20th Century, more and more facilities were added, mainly under the auspices of Ernest Kingsman, the owner at the time, who was evidently an astute and quite forward thinking leisure entrepreneur. A Lifeboat House as well as the classically named Blue Lagoon Dance Hall were provided. But he also saw other opportunities and thus the Ocean Theatre was constructed, as well as the Crystal Casino and, shortly to follow, a swimming pool. A roller coaster and open air stage were also provided. Canvas and Prints from the 1920’s to 1940’s can be found on this Clacton Pier Prints and Posters page. Sadly, the casino and theatre were casualties of war, when they were demolished during the Second World War, as parts of the pier had been sectioned off to prevent enemy invasion. Post war, the pier continued to enjoy a special place in the hearts of visitors. It then experienced significant damage as a result of a fire in 1973, which damaged the roller coaster. Then, storm damage in 1978 caused significant damage once more. The pier effectively languished for some years, a further casualty of foreign holidays becoming ever more popular and changing appetites of the British public. Then in 1994, a local businessman and his family bought it and embarked on an ambitious and it has to be said, successful modernisation project to attract 21st Century day trippers. Clacton Pier, now is home to a whole range of attractions. It is not a quiet, sleepy pier, but a modern, relatively vibrant amusement park and theme park combined into one big attraction. Clacton Pier is almost unique in the sense that there are some rides as you first enter and then the rest are dotted throughout the length of the pier. So you can just dip in and out of the fairground part of the pier. For the young at heart and daring of spirit, there is a whole host of rides to go on, with a total of 13 to tingle all your senses. Some of the rides are also available for younger children, from between 5 up to 12, so they won’t miss out on the fun. Dodgems and Waltzers are also featured, so you get traditional and state of the art rides. In addition there is a very interesting Sea Aquarium to get a real sense of what life is like in the ocean, combined with getting to see some traditional marine-life favourites. Or why not try the very interesting Safari Train? No pier would be complete without its amusement arcade and Clacton boasts a good range of machines, from the traditional type fruit machines, to state of the art games. It does tend to get quite busy in the summer, with the school holidays obviously being the peak season, as people come from quite a distance to enjoy Clacton. The pier also has a café and a pub. The pub is open all year round, with the main pier itself also open annually, although it does close on 1st January and on Christmas Day. No admission charge is applicable to the pier itself, but charges are made for the rides, as is pretty standard for a seaside resort. Wristbands can be bought by those who want to are dedicated enough to have a full day’s adventures. Prices are around £13, but obviously are subject to change. But, if you just want a gentle walk down the pier you don’t have to pay anything for the privilege of strolling down with an ice cream in your hand and just enjoying its own unique brand of seaside kitsch and watching the screaming hoards of people on the rides. Clacton is not a genteel and refined pier, its emphasis is on having seaside fun, trying out some of the rides, or simply having fun for an hour trying to win a few 2 p’s on the ‘penny fall’ machines. Or you can sit and have a drink in the bar, not forgetting the obligatory seaside activities of eating fish and chips and having an ice cream: whatever the weather! Although it is quite a large pier in terms of size (in total it covers some 6.5 acres), people in wheelchairs will find there is easy access at Clacton Pier, enabling everyone to enjoy its splendour. Clacton’s location at the south east of England, makes it a very temperate climate, so the weather tends to be much more forgiving than in other parts of the country. This makes it an ideal place for older people to go and gives Clacton a good mix of visitors in terms of age range, with people who are young going for the thrill of the fairground and older people just enjoying the seaside. The sea aquarium also makes it a popular destination with families, who enjoy the educational and fun aspects of the aquarium. From the pier you can also go fishing or watch the seagulls squabbling over scraps. 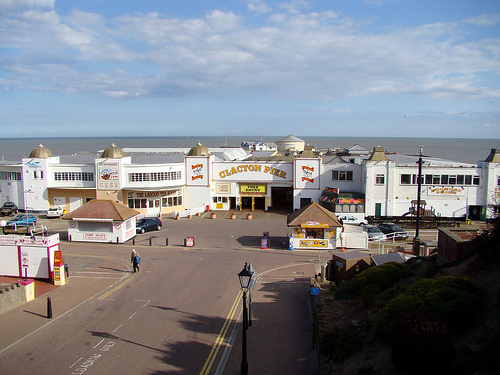 Clacton has the ability to offer something for everyone and is a great day out for all. Pingback: AGS » The Andy Geezer Interview..